Join Maritime Historian Rick James at the Maritime Museum of BC, to find out what really went down along the west coast during prohibition! On November 1 (5 PM – 7 PM), James will give an illustrated lecture on his recently released a book, Don’t Never Tell Nobody Nothin’ No How: The Real Story of West Coast Rum Running! 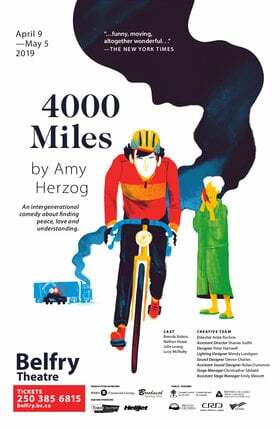 This talk is FREE and books will be available for purchase at the event. 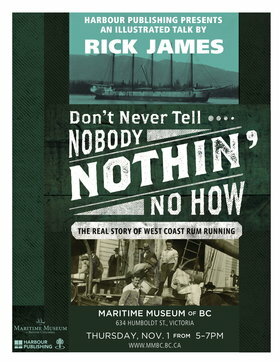 Don’t Never Tell Nobody Nothin’ No How is a lively volume in which James separates fact from fiction, taking an authoritative look into BC’s rum-running past. Contrary to popular perception, rum-running along the Pacific was usually carried out in a relatively civilized manner, with an oh-so-Canadian politeness on the British Columbian side. But there were indeed shootouts, hijackings and even a particularly gruesome murder associated with the business. Don’t Never Tell Nobody Nothin’ No How is impeccably researched, and James draws on first-hand accounts from old-time rum-runners, the often-sensational newspaper coverage of the day and his expert knowledge of the various vessels that speckled the coast—from beaten-up fishing boats to ocean-going steamers. In addition, he offers astute commentary on the parallels between the prohibition of alcohol and the regulation of recreational drugs such as marijuana. In Don’t Never Tell Nobody Nothin’ No How, James has brought history alive making it relevant to British Columbians today.